Book now the best shore excursions in Kaunos and Dalyan. High quality and safety at the lowest prices. If your are looking for the best Shore Excursion Kaunos and Dalyan, book now the best guided tours at lowest price with Ancora Tours. Since 2003 we offer you official guides in english, transportation and travel insurance, all included. The highest quality at the lowest rates. It’s easy to see why Marmaris is such a popular resort. It’s unique setting on the Turquoise Coast and its mountainous shores attract holidaymakers from all over. Our shore excursion heads to Daylan and Kaunos as we discover the history upon which the region was formed. What’s eating: Lentils soup for vegetarians and for the meat lovers the doner kebab. As a dessert don’t miss the baklava. We’ll leave the port of Marmaris by bus and drive for an hour and a half to the village of Dalyan, situated on the floodplains of Köyceğiz Lake. 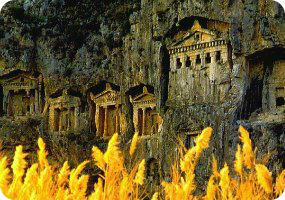 We can admire the ancient Lycian tombs amazingly carved into the surrounding cliff face. The largest and grandest tomb was built for King Dionysius. Smaller tombs nearby were for the noble and wealthy. Small pits dug into the rock wall were used by ordinary people and slaves. Next, our shore excursion takes a short boat trip to the nearby trading city of Kaunos. Named after King Kaunos, the grandson of Apollo, the city was an important sea port. Our tour will investigate the ruins and remains, some of which date back from the 4th century BC. We’ll see a temple, a Byzantine church and other tombs cut into rock faces. At the foot of an acropolis, we’ll see a theatre with both Hellenistic and Roman features. At the end of the excursion we return to Dalyan, where we wait for the bus to take us to back to port.